2.) John Schwartzman, Dr. Joe Allen, Ivan Bekey. - The Aerosmith Music Video 'I don't want to miss a thing' plus interviews with band members. 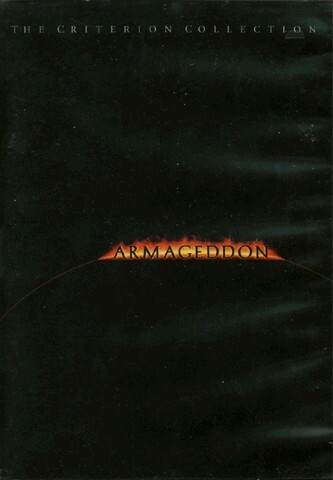 Unlike most of the recent disaster movies Armageddon never tries to take itself too serious. That probably saves it from ending in the hopless bin together with it`s siblings like Dante`s Peak and Volcano. The formula is a natural winner. 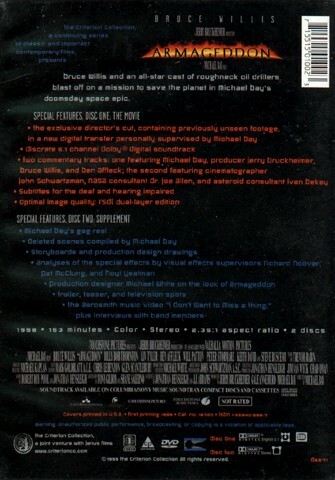 Take one megalomaniac producer (Jerry Bruckheimer), an all star cast (Willis, Affleck, Tyler), add some quirky support actors (Buscemi, Stormare), use some cool camera angels and edit like MTV and finally get a lot of special effects. You just can`t lose. Ok, it`s a completely irrational, stupid, infantile sort of movie. Infact you might feel that your intelligence has been offended by this rubbish. However, when you get over these minor problems, you will be able to enjoy one great action adventure. Never a dull moment, cheap jokes and all over great fun.